I know of two policy channels through which to push back on recessions: monetary and fiscal. 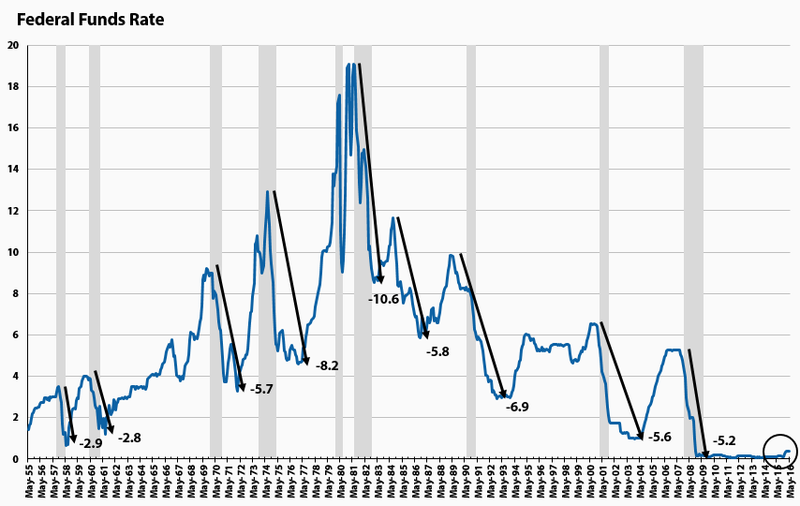 As I discuss in today’s WaPo, though who knows when the next downturn hits, we’re not ready. Monetary policy–ie, the Fed’s main tool: its Fed funds rate (ffr)–is very unlikely to have time to reload. I think this is a pretty striking picture of the extent of ffr reductions in past cycles of monetary stimulus. But there’s still fiscal policy, right?? See, Congress, US, under subheads: a) dysfunction/gridlock, b) denial of efficacy of fiscal stimulus, c) embrace of fiscal austerity. Share the post "We’re not ready for the next recession"
3 comments in reply to "We’re not ready for the next recession"
b) Trump is elected, recession hits, congress passes tax cuts, deficit balloons, as it should in recession, economy recovers, recovery based on windfall to the rich not robust, job creation lags, inequality rises, but possibly performance is good enough for reelection of incumbent in 2020. Weak recovery from inefficient deficit inducing tax cuts (and incompetent opposition) still got Bush reelected in 2004. Inflation is too low making recession more likely. If a small economic shock hits, the relative prices and wages (sticky downward) can be reset upward if the size of the resets are less than the inflation rate. If a large shock hits that is much greater than the rate of inflation, then pressure to reset wages downward results in higher unemployment and pressure to reduce price below cost of production will result in lower production. Inflation must be high enough to accommodate most of the shocks. Most shocks are low. Few shocks are high. If inflation is too low, more shocks will exceed the ability of inflation to accommodate wage and price resets and more and longer recessions will occur. This is why a 2% inflation target is a bad idea. My favorite plot is this one with the 10 year Treasury rates added, which shows how high the FED can raise rates to get head room to do the decreases needed to fight recessions (each peak before your marked easings is up at the 10 year rate since the 80’s). Currently the 10 year rate is at about 1.5%, so even if they manage to raise up to this rate they have very little stimulus via a rate drop to use. So unless they can do something to get 10 year rates up (say raise the inflation target) they have no room to maneuver.